A woman peruses different vegetable options. Some vendors at the indoor winter farmers’ market in Evanston are using sustainable technology to grow plants during the cold months. Every Saturday morning, Ed Kugler stands at his booth at the indoor winter farmers’ market in Evanston, selling microgreens he helped grow using sustainable methods. Kugler said his microgreens — short, vegetable greens which are typically sold locally, as opposed to being shipped nationally — are usually bagged the day of sale and last for less than a week. He said he is one of a few vendors at the market who offer certified organic fruit and vegetables. Kugler said his microgreens have found success at the market, held on Saturdays from 8 a.m. to noon at the Evanston Ecology Center. The market features about a dozen vendors selling bread, cheeses and apples. It will continue through the end of April, and the outdoor market in downtown Evanston will reopen at the beginning of May. 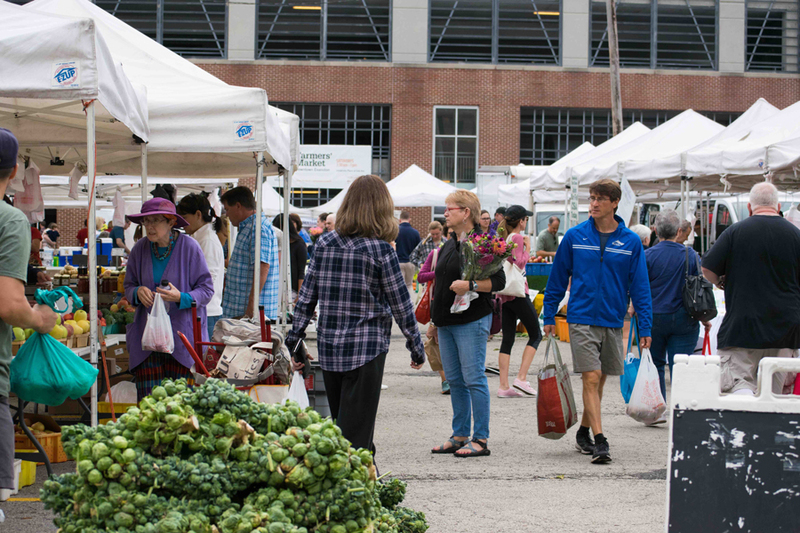 Evanston’s farmers’ market manager Myra Gorman said through the market, people in the community have gotten to know local farmers well. A resident of Highland Park, Kugler first sold his sprouts at the Ravinia Farmers’ Market 40 years ago. In addition to selling at the market in Evanston, Kugler also has teamed up with Highland Park High School and its Advanced Placement Biology classes to visit his at-home “teaching garden” and help students become familiar with horticultural skills. He said through teaching the cultivation of microgreens and sprouts, he can create the first impression students have of gardening. Kugler said his microgreens take anywhere from a week to a month to grow, depending on the desired length. Kugler partners with landscape architect Robert Boyce and raises his microgreens at Boyce’s greenhouses for harvesting. Though the lack of light is a major obstacle to organic farming in the winter, Kugler said microgreens can grow in the winter despite low levels of light. Boyce holds his greenhouses at a temperature between 50 and 60 degrees for optimum growing conditions. Boyce plants the seedlings in the greenhouse around February and moves them outside in the spring. Boyce and other customers purchase the seedlings for personal garden use, he said. His greenhouse grows only organic products; including tomato and pepper plants, native plants and flowering plants, such as perennials and annuals. Kugler said when he first started the teaching garden, less than a quarter of his students had any experience with at-home gardening. He said he hopes they take the skills they learn from him outside the classroom.